Martell, Martell, wherefore art thou..? 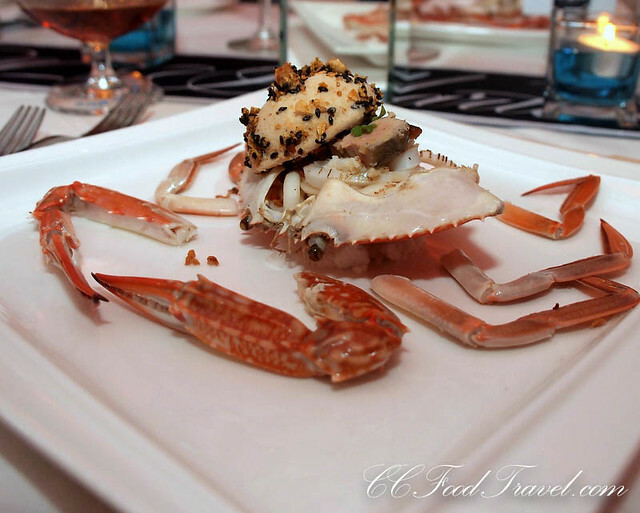 CCFoodTavel fly to Penang, for the Martell Pure Gourmet dinner.. would it be worth the journey? 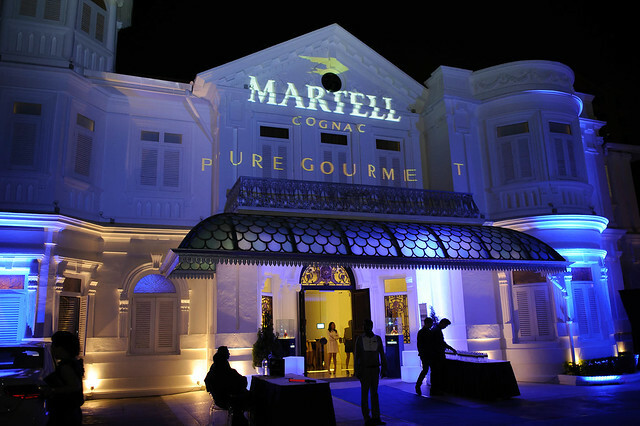 Martell, the oldest cognac maker in the world, showcased its Penang edition of the Martell Pure Gourmet signature dinner series in the UNESCO World Heritage Site city of George Town. The capital city’s unique blend of cultural and historical townscape located in the island side of Penang makes it one of the most interesting destinations in Asia to live in and to visit. 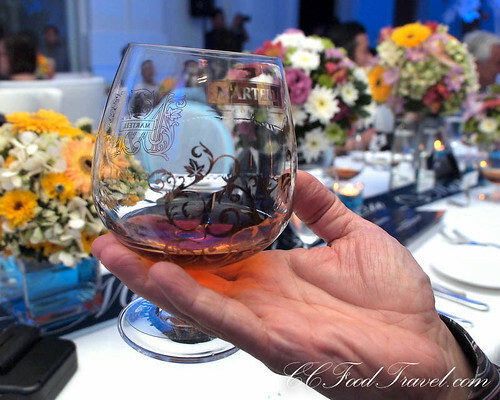 We were fortunate to be able to attend this gourmet feast – a tribute to Penang’s heritage and culture – by marrying Anglo-French cuisine with a twist of Penang flavours, and paired with the finest Martell cognacs. Pure Gourmet is a campaign by the French spirit maker and distributor, Pernod Ricard, to encourage the glorious experience of pairing different Martell cognacs with fine food. We stayed at the venue itself, in the ultra swanky Macalister Mansion. There are only 8 rooms in this large sturdy colonial building formerly known as the Choong Lye Hock Residence. Opened for less than a year, the double bedrooms of different dimensions had been given a personal touch by its owners with handpicked avant garde to modern classic art pieces and furniture, and fitted with some of latest electronics for modern living such as an internet ready flatscreen television, Bang & Olufsen sound systems and a nespresso machine. 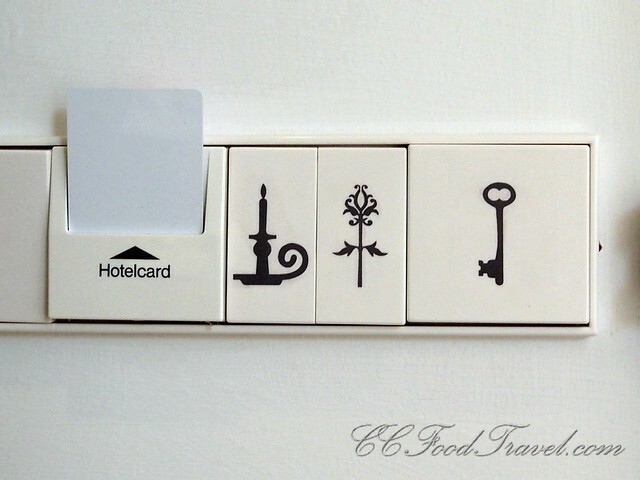 Imagine Phillippe Starck inspired decor and you will know why we were more than delighted to be staying here. 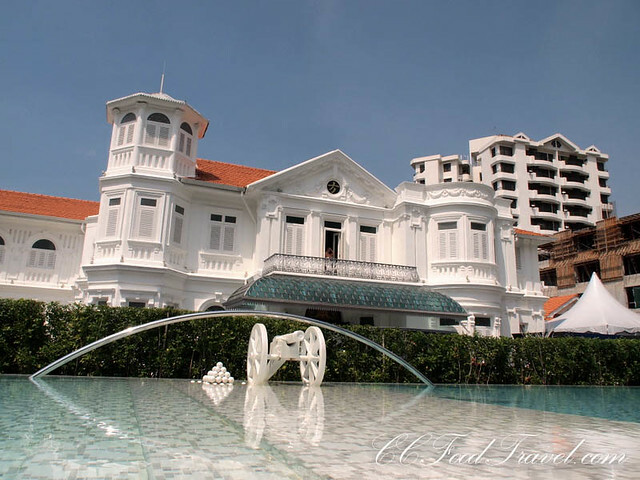 We won’t be ashamed to say that this white mansion was certainly one of the current, best boutique hotels available on Penang Island, if one is seeking luxury comfort in an old meets new setting, and within the vicinity of the George Town attractions. In anticipation of the main event of fine food and cognac, we were introduced to the finer aspects of Martell’s cognac range with a tasting workshop facilitated by Martell’s Brand Development Manager, Christophe Pienkowski. 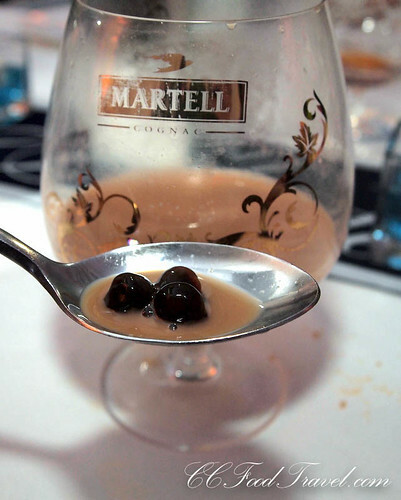 Having been a former chef, and world traveller, Pienkowski explained Martell’s history, and their cellar masters’ expertise in selecting the best grapes from the four finest growth areas – Grand Champagne, Petite Champagne, Fins Bois and Borderies – to make eaux-de-vie (un-aged or mildly aged fruit brandy), double distilled in Charentais pot stills then aged to perfection in Troncais oak wood fine grain barrels. 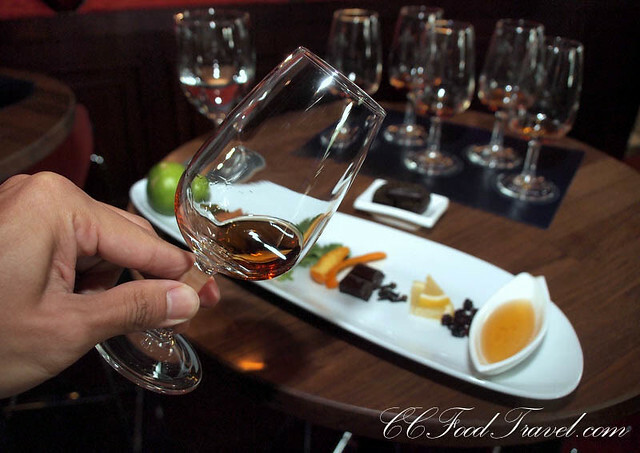 The unique blending and aging processes for each cognac yields different flavor or taste notes, creating the marvelous series of Martell cognacs, which many of us are familiar with. 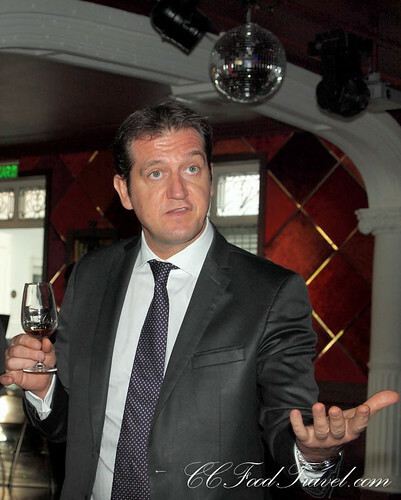 Pienkowski helped us discover the unique tasting notes which distinguishes the XO, VSOP, Cordon Bleu, Chanteloup and Creation Grand Extra cognacs. 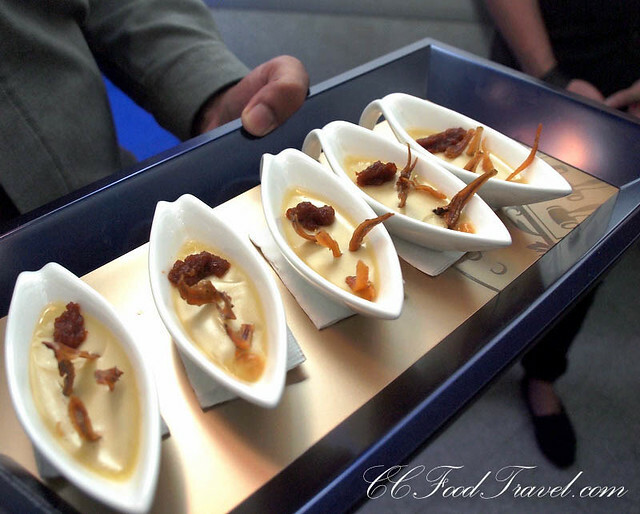 FatBoyBakes was quick to point out these hors d’oeuvres of spicy prawn paste and fried anchovies in a coconut pandan custard was reminisce of a deconstructed nasi lemak. If not for the dinner, we would have devoured all the tasting portions. 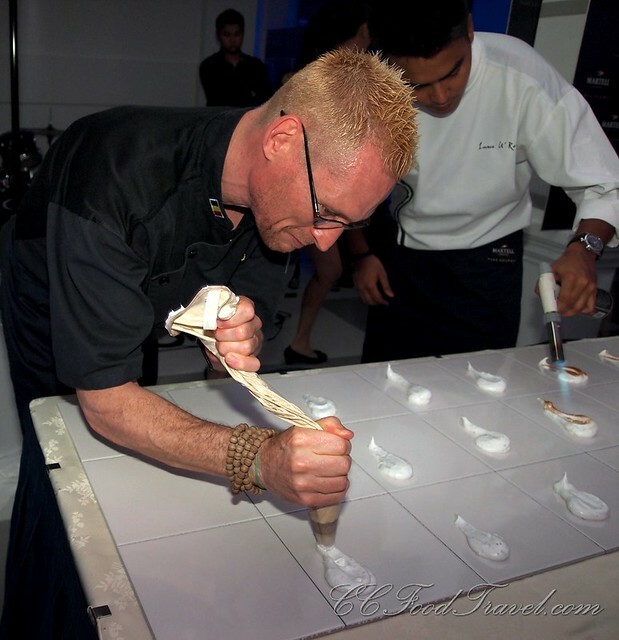 Chef Emanuelle Stroobant, friend and accomplished chef, was the one to helm the kitchen for this Pure Gourmet event. 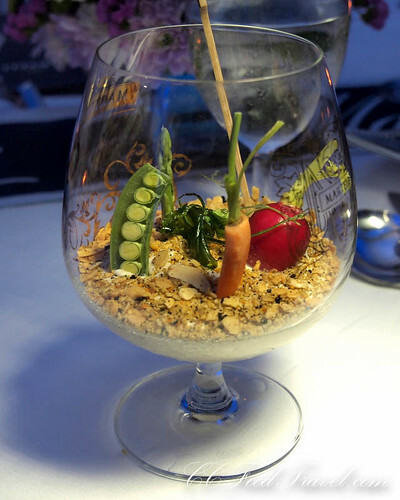 For the amuse bouche, he created a tropical garden in a brandy glass. The soil comprised of almond, coffee and orange, planted with water chestnut, pink raddish, micro cress, eggplant puree, baby carrot, and snow pea. An amuse bouche is normally served in bite sizes but this was a whole dish in itself. The natural raw flavors of the vegetables paired well with Martell Cordon Bleu’s elegance and aromatic richness of fruity-spicy notes – the hints of toasted almonds, crystalized plums, cinnamon and orange tree flavours. This appetizer certainly prepared us for bigger and tastier things to come. Martell Cordon Bleu is the top selling cognac in Malaysia for Martell and Malaysia is second in sales only to China. An interesting fact shared by Pienkowski. This was Stroobant’s take on Penang’s curry mee. Instead of prawns, the dish was redefined with crab meat and a mix of spices, herbs chillies, sambal and coconut milk whipped up into a paste topped above cold udon and soba noodles which had already been marinated in cognac crystalized plums. A slice of perfectly cooked foie gras added a French touch to the South East Asian inspired dish. 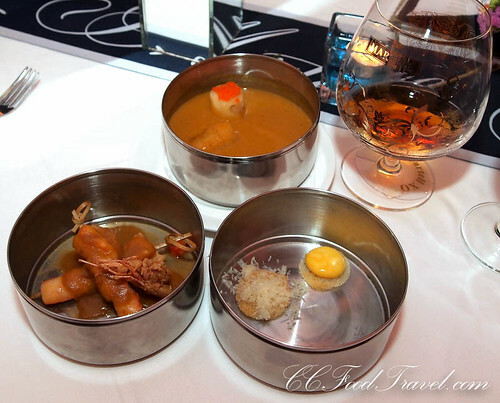 Exquisitely presented with the shells of a flower crab, the cold natural flavors of the lightly spiced crustacean sorbet, meaty overtones of foie gras, and noodles blended together nicely with the Cordon Bleu’s rich, complex taste and long finish. We certainly wanted more of this. Hot Starter of The Straits Prawn Bisque paired with Martell X.O. 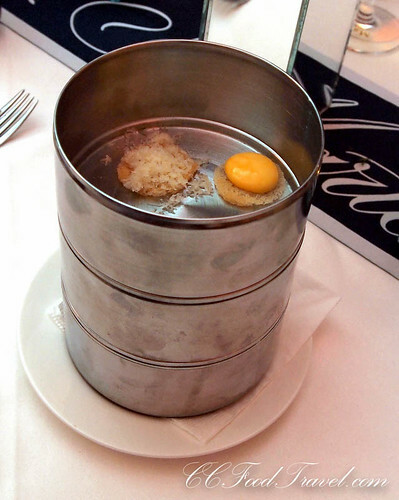 A French bisque soup and prawn curry served in 3-tier tiffin carriers synonymous with the Asian take-away culture from days of yore, when mothers and wives would prepare nutritious, comforting meals placed in stacked cannisters to be kept warm and taken away by their husbands and children on their way out to work and school. In Stroobant’s creation, the top tier had bread crusts with shaved cheese and saffron foam. The middle tier, a potato bouchon topped with prawn eggs in a pond of prawn bisque with prawn cubes. The bottom tier, skewered grilled prawn, poached prawn, and a fried prawn head. Martell X.O. cognac created with the elegance of Borderies and the intensity of Grande Champagne eaux-de-vie revealed strong aromas of ground spices such as coriander, black pepper and berries, and fruity bouquets of fig chutney, beeswax, walnuts and even sandalwood. The potent flavors of the sea and creamy texture from the bisque paired excellently with the bold X.O. Duck a l’Orange is a British take on the popular French dish, Canard a l’Orange, from the 1960’s. On this special occasion, the dish became a celebration of Penang’s unique cross cultural heritage resulting from Captain Francis Light taking over the island and converting it to a British trading port, welcoming international traders around the late part of the 18th Century. On a dark tile lay 2 portions of duck meat. 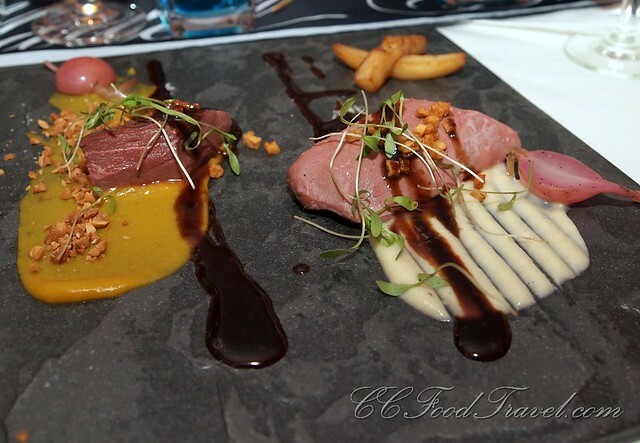 The darker meat with skin lay on pumpkin puree and curry sauce while the lighter colored meat lay on parsnip vanilla. French fries served at one corner accompanied the meat. Sprinkled with fleur de sel (flower of salt), garnished with peanut crumbs, raddish, wild herbs and drizzled with chocolate sauce, the epicurean delight looked extravagant to say the least. The Creation Grand Extra is one of Martell’s premium cognacs and we certainly are in agreement with this fact. The luminous, amber cognac had intense flavours and a harmonious bouquet with notes of fruit preserve like lemon, orange peel and damson. Further tastes reveals exotic aromas of cocoa beans, intense dark chocolate, vanilla, and curry paste. What grabbed us was, the silky smooth ease with which we could drink the Creation. We enjoyed it neat. While bold, complex and intense, the cognac bolstered the strong duck meat taste together with the vanilla and pumpkin-curry sauces. An extremely premium experience, indeed. A dessert inspired by one of Penang’s most famous hawker foods, the laksa dish is normally served hot with chewy rice noodles in a spicy fish-tamarind broth topped with freshly chopped pineapples, ginger flower, fish meat, mint leaves, and a side of thick shrimp paste. 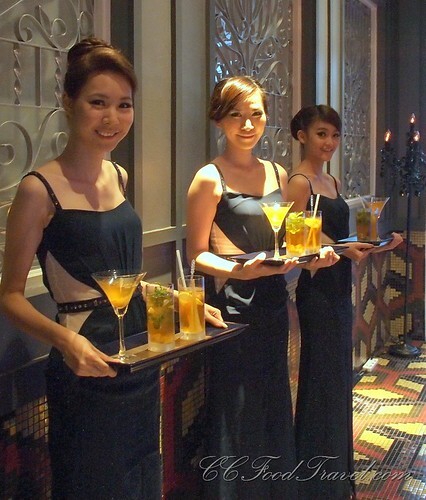 Its flavours of sweet, sour and spicy best describes South East Asian cuisine. Stroobant’s flambe creatively explored a cold version of the Penang-style laksa with lemongrass meringue, cognac marinated pineapple cubes, tamarind marinated cucumbers and sprinkles of ginger flower and gingerbread crumbs. The Martell Chanteloup Perspective is produced by combining the four main growth areas, or ‘crus’, of the Cognac region: Grande and Petite Champagne, Fins Bois, and in particular, Borderies. It is an ‘Extra’ cognac which has perfect balance of aromas and sensations – notes of honey and fresh fruits such as peach and apricot with aromas of candied fruit – fig, raisins, almonds and walnuts. The sweet and sour dessert with the pungent flavor of the torch ginger flower complement the supremely intense notes of the Chanteloup Perspective perfectly. A night cap to cap off a wonderful evening of luxurious epicurean indulgence – Tapioca pearls in milk tea. Possibly a tribute to the ubiquitous tea stalls managed by Indian Muslims around the island and the rest of the country. Martell, Martell on the wall, which is the finest cognac of them all? 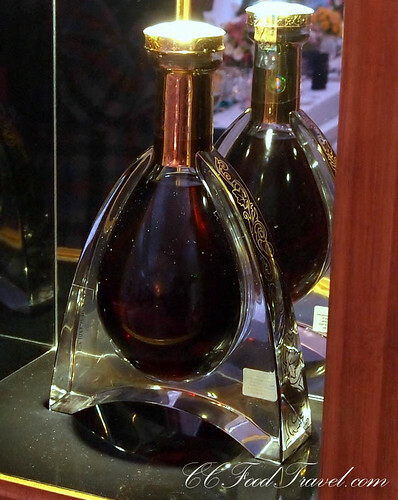 Why L’ Or de Jean Martell, of course, retailing only at USD5,000! And with that, dinner drew to a close. What an experience, and what a venue! We would definitely be coming back for an extended vacation, right on this premises, very soon. 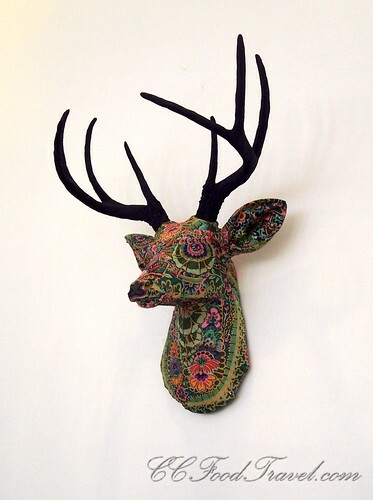 Loved our posts? Check out more travel escapades on our FB page! 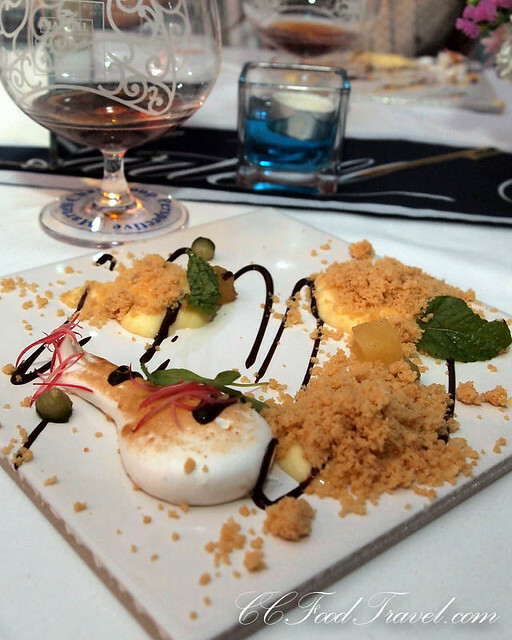 wow all the dish pairing is so creative…I would love to try given such opportunity! yes a rather memorable night with great food and good company.. and of course, a lovely ambiance! i want a lemongrass meringue now. One of the best desserts to date! Lovely venue and food…quite an experience for the palate. Lucky you! Yeah lucky us! LOL. I can’t wait to go back and stay at the hotel!